Robot Gossip: Robot DJ Keeps the Party ON! Robot DJ Keeps the Party ON! The Juke Bot is a pair of Kuka industrial robots; each is surrounded by a set of platters (you know, vinyl LPs). The two bots act independently, deftly grasping an LP, and then bringing it to a platform with a phonograph needle. 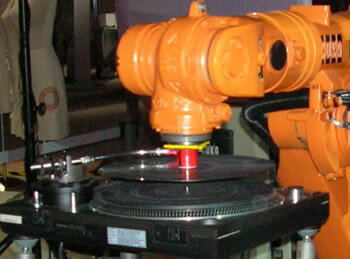 Delicately, the robot presses the LP against the needle and begins to rotate it forward and backward, creating a unique performance sound. And don't confuse it with those virtual software juke bots - this is a five foot tall mixmaster. California Teachers Replaced by Robots?